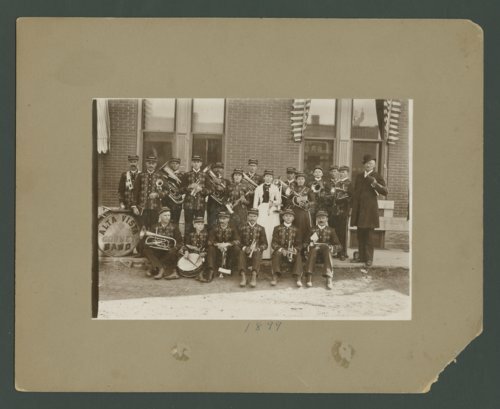 A photograph of the Alta Vista Cornet Band in Council Grove, Kansas. People in the photograph are: standing (left to right) Martin Biglin, Gus Webber, George Turney, Bret Hull, Will Karnicky, Hala Bond-Baugh, Charles Chitty, Rachel Thomas, Robert Webber, Min Biglin-Jacobs, Ralph Hull, Milt Bond, Paul Johnson, Prof. Hull; and sitting (left to right) Union Thomas, Pearl Thomas, John Wild, Andrew Turney, Ottis Turney, and Herman Webber.